The Think Movement by J. Sakiya Sandifer » just don’t read this story…live it!!! “They used to call us the Kings of Kingshighway, because we own so much on this street,” Michael Roberts says. Their office is the culmination of hard work and a can-do American business attitude to strive for greatness. They launched their business from a historically black neighborhood in north St. Louis. From a one-room office, they created an empire now made up of 76 companies and 1,100 employees, many of them minorities. They own commercial real estate, TV stations, hotels, telecommunication companies and more. The name Roberts adorns all their properties. “We weren’t rich. We weren’t poor, but we just never had any money,” Michael says of their upbringing. They like to tell their story, encouraging people with new ideas to chase their dreams. If you don’t have money, they say, don’t let that stop you. They point to their father as exhibit A. At 86, he still comes to the office that his sons named after him, the Victor Roberts Building, a large complex complete with restaurants and retail stores. He worked 39 years in the Postal Service before retiring in the 1980s. He now keeps a keen eye on his now grown boys. He refuses a paycheck. 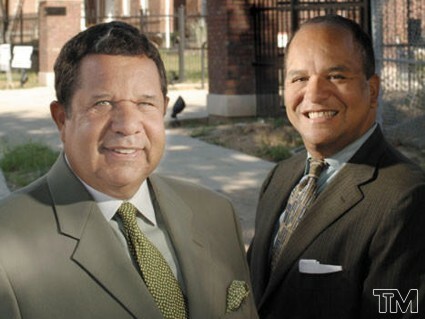 The two brothers also have served in public office, elected to the St. Louis Board of Alderman in the late 1970s. hey recently walked through The Roberts Orpheum Theatre in downtown St. Louis. It symbolizes their quest for a legacy. Decades ago, their mother and other black people were only allowed to sit in the highest balcony. Now, the brothers own the theater. They stood on the stage and scanned the empty seats. Again, they laughed. “Mom can sit wherever she likes,” Michael Roberts said.